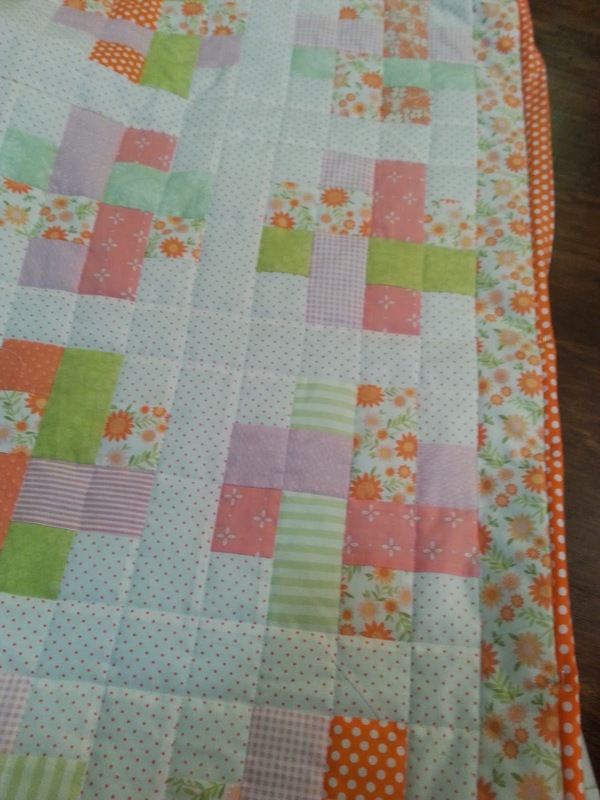 I found this block style on Pinterest and decided it would make a beautiful baby quilt with the pink, orange and green fabric I found at the Fabric Center located in West Jordan. Finished quilt measures about 40 by 48 inches. 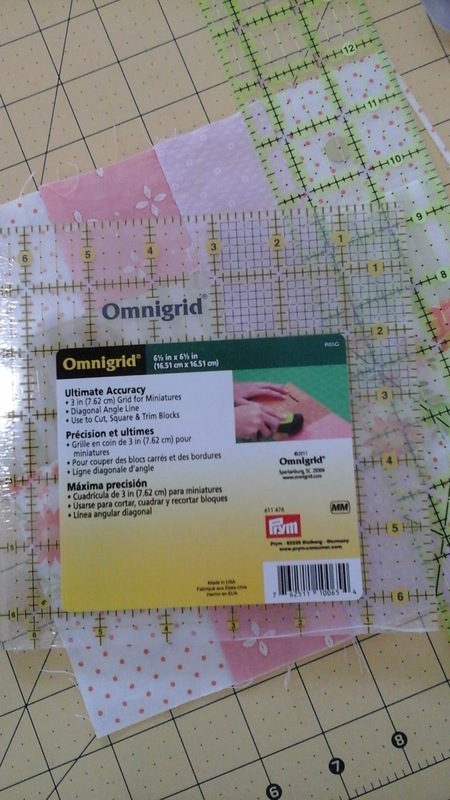 First, cut out 160 -2 1/2 by 2 1/2 inches squares;80- 2 1/2 by 4 1/2 inch rectangles; 16- 2 1/2 by 8 1/2 inch rectangles (sashing); and 3- 2 1/2 by 45 1/2" rectangles (sashing). 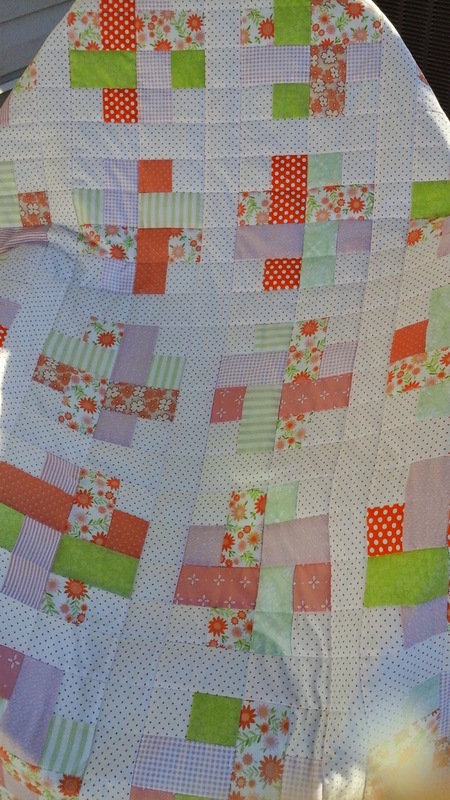 Note* I didn't cut sashing pieces until I had blocks together in order to allow for any discrepancies in measuring. 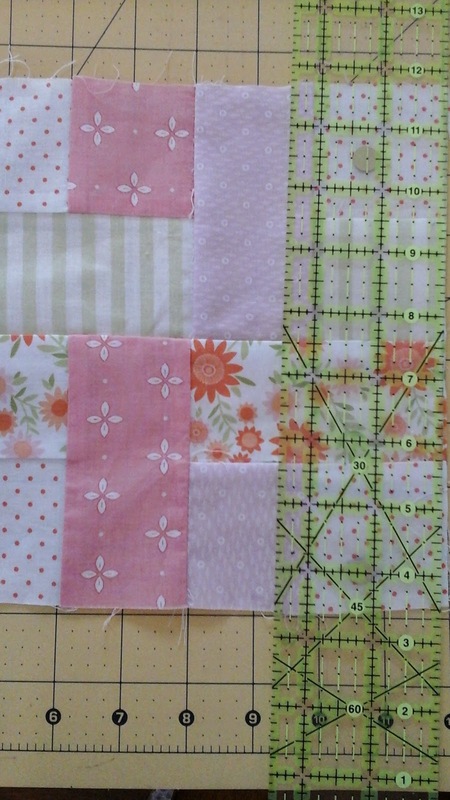 Sew the 2 1/2" squares to the 4 1/2 x 2 1/2"
After blocks were sewn together I squared them up to measure 8 1/2 by 8 1/2". After all squares are together lay squares out to decide what design works best (wish I had a design wall, but, alas, maybe one day and floor works too). 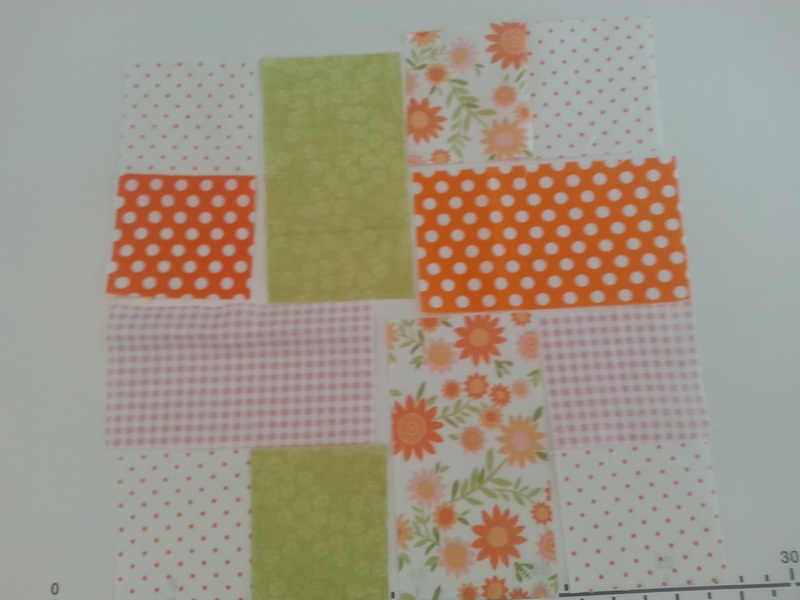 Sew short strips of sashing in between squares, then long pieces after squares are sewn together. (Make sure to sew the shorter pieces on first...obviously). 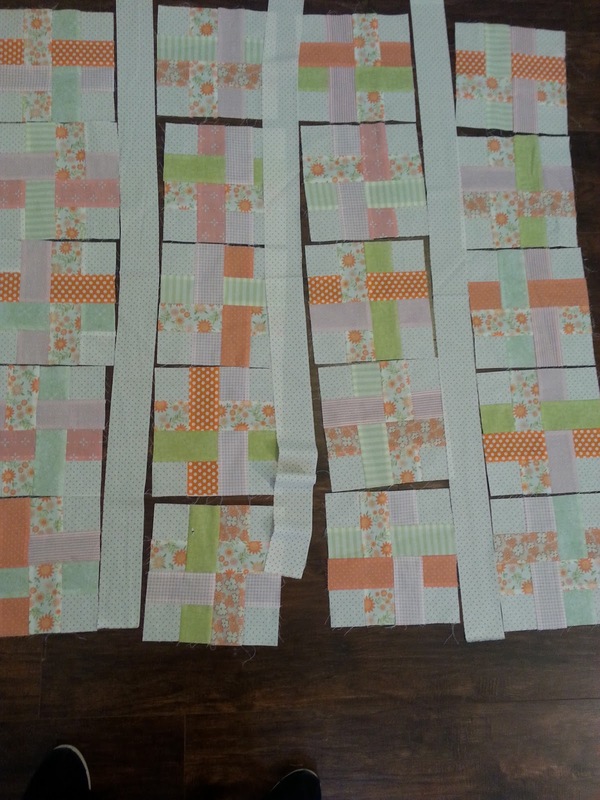 For flowered sashing you will need two strips measuring 2 1/2 by 45 1/2" and two strips measuring 2 1/2 by 40 1/2". 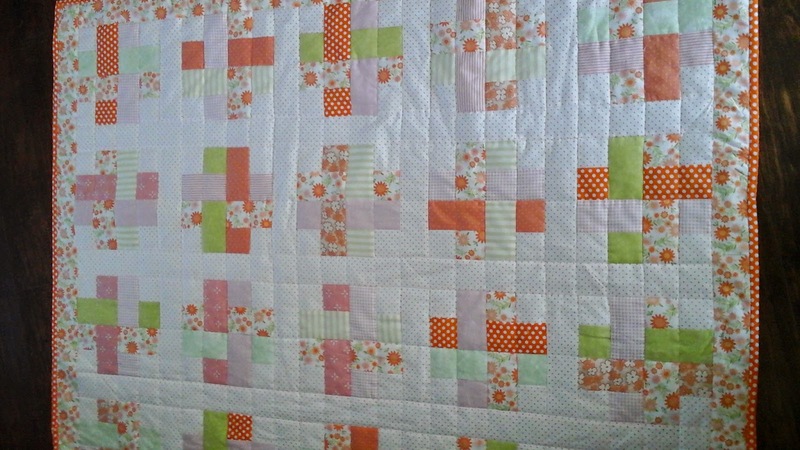 This quilt was quilted on my Jaome 8200QC using the walking foot and sewing along the square seam lines.